The setting for the meal was a street bench on Boulevard Saint-Germain in Paris, right across the street from the meat shop Boucherie de Saint Germain. Hunger struck as we passed a bakery. For €0.60 we got half a baguette. Next door was the meat shop, Boucherie de Saint-Germain. We pointed to the leg of cured meat and gestured to get a couple slices. We also ordered a slab of pate. Both meat items were under €8. With those three simple ingredients, we were able to make a savory baguette sandwich that was crispy, flaky, rich, and creamy. The only thing missing from this sandwich was some kind of sweet fruity jam to offset the saltiness of the cured meat and pate. 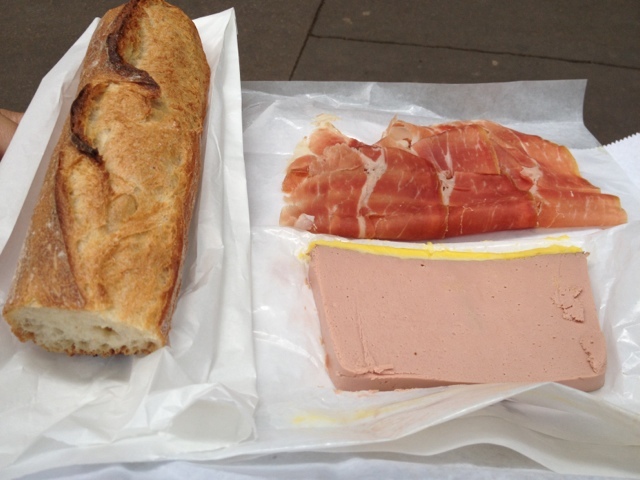 In the end I felt like a queen enjoying a pate baguette for under €8.50. It was the greatest meal of the trip, simply because it happened organically, it was authentic, and there was zero tourist persuasion involved. There's nothing like a street bench lunch with a side of people watching. World's Tiniest Wine Bar in Paris!